… mixed as in the Back to Basics post. Flatten the balls and place them on a flat surface (if you have English muffin molds, you can follow Zoe’s instructions here for shaping). Cover with plastic wrap, and allow to rest for 30 minutes. 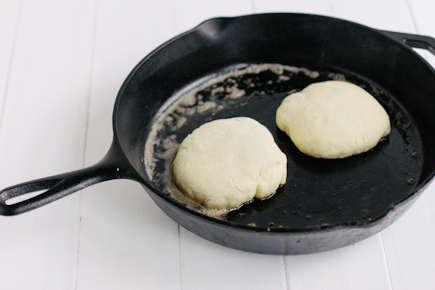 Heat up a large skillet (cast iron works well) and inside place 1 tablespoon of Ghee, clarified butter or European style butter (you can use regular butter, but you have to be careful of the butter burning. The ghee and clarified butter have a higher burning point and allow you to cook without worry of it burning). Cook for about 3 minutes. When the bottoms are golden brown and the muffins have puffed, flip them over and cook, until the muffins are cooked all the way through and are golden. 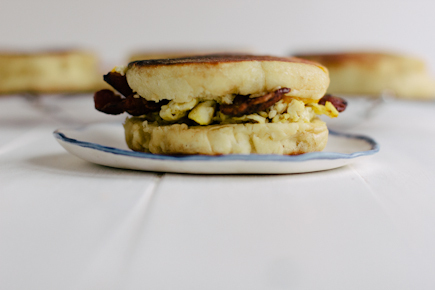 Let cool slightly and serve with butter and jam, or eggs, bacon, and cheese (the best breakfast sandwich you may ever have!) The English Muffins also taste delicious re-toasted the next day. I love this recipe and thanks for showing us how. I have never made English muffins but so love them AND have long wanted to. Living in France, I cannot go out and buy them so this is perfect! fabulous! If you had to guess, what was the difference this time? A long time ago I made homemade English muffins using an electric skillet. I recall that working very well. I think I need to do it again! I will definitely try these! A question about the amount of yeast–I notice you’ve changed this to 1 T. instead of 1-1/2. I know I should just trust you and give it a try, but 1-1/2 has always worked fine for me. . . I wonder if you changed it so that it’s easier for people who just want to buy packets of yeast. That was part of it. But mainly we found that we couldn’t tell the difference with less. And it’s a relatively expensive ingredient. And some people definitely prefer the flavor with less. See what you think. I made these today with a pumpkin bread dough from the original book. The dough was a week old, so I let rise for about 50 min. Sadly, they didn’t turn out as I hoped – cooked on outside, but too doughy ( gummy) in center even after splitting and toasting one of them. I did test for doneness with a toothpick, but I think it was deceiving. I love this idea so much though, that I will try again maybe on lower heat for longer period ( the outsides were quite brown) Just wondering if you have other method for testing doneness? I’d have guessed that the pumpkin dough wouldn’t be a great choice here– that really needs a full resting-rising time before baking. White dough is much more forgiving. You could try a longer rest after shaping (before griddling). You’re right, the toothpick method can be misleading. Internal temp is also unreliable; I wouldn’t buy a thermometer just to try it, but if you have one, 205F? Problem is where exactly to place the probe– needs to be right in the middle to be meaningful, hence, I’m not crazy about that method. Thx for reply. 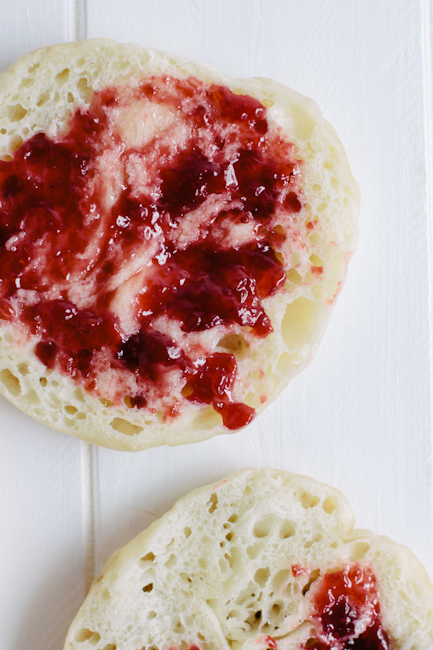 I will try these again with a white dough – love thought of making my own English muffins. These look wonderful, I love all the nooks and crannies! I make English muffins all the time using Gold Medal AP Flour and Red Star quick rising Yeast. After mixing and first rising I roll the dough to about 3/4″ and cut with a glass and let rise again.I find that cooking them in a nonstick skillet over med.heat about 6 min per side is perfect. I have tried the cat iron skillet but the temperature is easier to adjust in the nonstick. Love your Blog. After mixing the dough, does it need to rest for two hours, or can i jump right in to the muffin makin? Definitely need to do an initial rise after mixing or it won’t work. Saw these last night so I rushed to make Ghee so I could make these this AM. Then I made these this morning with Master Recipe from HBIN5 and served with pumpkin spice cream cheese after splitting open. DELICIOUS! This recipe sounds amazing. We had been talking on Instagram and you asked me to comment on a post. My question was how to keep the dough perpetually in the refrigerator as you use it throughout the week without having to start new batches every time. I made these yesterday and they are excellent. Using the clarified butter / process described. Very easy too. Good way to use small amount dough left. I also made these yesterday, and they were great, both right out of the pan and toasted this morning. I used plain butter, in a heavy-weight non-stick pan, and that worked fine. i plan to make some more, split them, and put a supply in the freezer. These look amazing! While I like English muffins, I really love crumpets…is there a way to tweak this recipe a bit to have more of a texture like crumpets, or, are these homemade ones pretty comparable to crumpets? What temperature to heat the pan please? Medium, med High? Cover pan or no? Thanks! I’m just checking with Sarah to hear exactly how she handled this; how about I get back to you here tomorrow? Traci: it was medium heat, no cover. Probably room for experimentation on the cover question. Made these this morning with my version of the whole wheat master/sandwich bread blend from the HB (I add a drizzle of olive oil & honey, plus replace some of the water with soaked flax meal as an egg replacer so I don’t have to wash the container). We shaped them last night and put them in the fridge so we wouldn’t have to deal with rise time. the first ones came out fairly tall and without the craggy inside we love. I stretched the second half a bit, and they turned out great, short and and full of holes!! Thanks for the great, quick breakfast idea. This sounds great, will have to try. right now I am thinking of baking rolls from the rye/caraway potato bread recipe. do I have to use a lower temperature oven and less time baking or could I follow the times and temp from the thanksgiving rolls even tho that was white and this is rye….help! 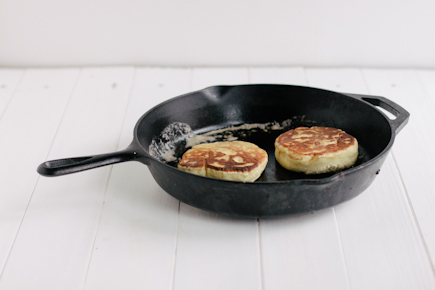 I like to dip my uncooked English Muffins in dry cream of wheat cereal or in corn meal and cook them in a dry cast iron pan/griddle, without the butter. They won’t stick. European Peasant bread is great this way, as is the ABin5 Master Recipe. Thanks for this suggestion! I made a batch this way, flattening the balls of dough on a cornmeal-sprinkled cookie sheet, flipping and coating the other side. I put a light film of butter on the skillet. Worked great; I’m glad to use less butter. I used the European Peasant bread dough. I maybe prefer the plain boule dough for these, but the peasant bread dough was also delicious. Correction: I don’t just dip the muffins, I let them rest in the dry meal. It stays on better! My stovetop has a temperature-settable gas griddle that is bigger than my cast iron pans. What temp should I set it to in order to cook these? I’m guessing 325-350. Hmm, haven’t used one of these, so you’ll have to experiment. I did them for about 5-6 minutes per side at 375. A little longer might have been better to get them a bit browner and more done, but we were very happy with the recipe and ease of making them. BTW our flour may have been a bit drier than yours normally is as I had to add about 20z more water to the New Basic Recipe in order to get a good wet dough. My daughter and I tried the English muffins and they were awesome! We burned the butter on our first attempt to make the Ghee, but it worked fine on the second. Quick, easy and delicious! Thanks for the inspiration. Mine came out wonderful. Next time I’ll lower the heat in the skillet, because they browned before the insides were fully cooked. I finished them in the oven for a few minutes. YUM! What is “ghee?” I’ve not heard of it before these English muffin posts. Indian-style clarified butter, which tolerates high frying temps w/o burning. Which book do you have, can’t remember which one has the recipe for that but can check? I have the most recently released book “The New Healthy Bread …” Just checked the Index and ghee is not listed. Lately I’ve been hearing about avocado oil having a very high smoke point. Recently 1L bottles were available at Costco for just under $10. Would it be similar to ghee? You’re right, we didn’t put a ghee recipe into the book, most people just end up buying it in a South Asian food store, or you could just make your own clarified butter (but you’d have to find a recipe on the web). But– ghee isn’t essential to the flavor of Engl Muffins, could just use canola, soybean, or peanut oil (if you’re not allergic). Or maybe your avocado oil would work– though it won’t taste like clarified butter. We haven’t tried it. Thanks Jeff. There is an Asian market just down the road. I will also try the avocado oil, but — there is nothing as good as butter. When I find the ghee I’ll let you know how they compare; ghee, clarified butter, and avocado oil. Maybe a canola or soybean oil too. 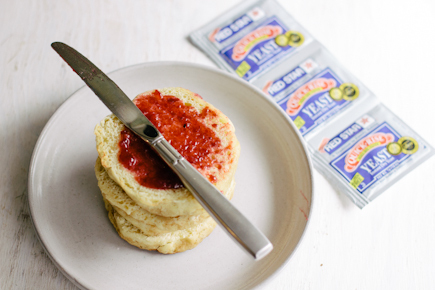 I am getting anxious to try the English muffins so many are talking about! You still need the initial rise after the mixing of ingredients. Can’t just mix the flour, water, yeast, salt then shape and make the muffins. Assumption was that you had pre-risen dough. Has anyone tried this with the GF basic recipe? I tried it as well. Yes, it did work. Haven’t had an English muffin in quite a while. Definitely enjoyed that breakfast sandwich. I tried these muffins with healthy artisan bread dough in my non stick skillet. Came out superb!! Just needed 1 tsp ghee/clarified butter. I plan to give the basic recipe an Indian twist.Planning to make it for some friends tomorrow. Would love to aend you the photos. How do I go about?? You can join the Flickr group at http://www.flickr.com/groups/artisanbreadinfive/ and upload your pictures there. Then copy the picture’s link into any of our “Comments” fields and they can be viewed by everyone. I tried Engliah muffins with an Indian twist, usung Healthy Artisan Bread dough. Fantastic, and thanks for using our Flickr site. Great shot. I am making these tomorrow morning. Imagine how much greater my Eggs Benedict will be with homemade English Muffins. I am SO excited… Made baguettes from KA’s classic recipe last weekend and they were fabbo, which prompted me to look for more ideas and thus I found your blog and book. BOUGHT IT on Thurs, mixed up my first batch of dough last night, and this morning I grilled a couple English muffins on the gas cooktop using ghee. Dear Lord, help me to exercise self-control, because I could eat them ALL. Toasted with butter and scrambled eggs, best breakfast I’ve had in ages. A thousand times tastier than store bought. I am in heaven. THANK YOU! I’m so excited to try the brioche. I make killer French toast and brioche is $6/loaf at my nearby and beloved Whole Foods. People have baked bread for hundreds of years. Only makes sense that there would be a simple approach. This is just wonderful. I ordered the muffin tins from KA last year so will have to try them after the holidays. i love english muffins, the good kind, so really very anxious to try them if i get the time. thanks for putting up your recipe. I will have to get your new book to add to my collection. i was using two of your books last year. I recently made muffins from the pumpernickel bread recipe–also delicious! They took a little longer to cook through. That’s a great idea, will try it too. I’m really looking forward to making these. My only question is… Do you have to use dough that just finished with the 2 hr rise after the initial mixing, or can you use your refrigerated dough and allow to rise 30 mins? I may have missed the answer in the recipe above. Thanks! Yes, you can use your chilled dough and let it rise for 30 minutes. Last night I decided to gve these a try. After cooking them in a cast iron pan to brown them I put them in a 325 degree oven for approx.12 minutes to cook them thru. We fork split them this morning and I must say they were great. We split them with a fork and they were very very close to the original “nooks and crannies” muffins. I am going make do some and bring them to work this week. I am having a lot of fun here :-). Now to try some ……. bagels. Just made my first batch of the master dough last week. I made a boule in a cast iron dutch oven which was awesome!My husband was so impressed! This morning I followed directions for English muffins. I placed them in my cast iron skillet and cooked them for about 5 minutes on each side, till browned. However, they were still doughy inside…I put them in a hot 350 degree oven for about 6-7 minutes, but they were still doughy in places. Any suggestions would be greatly appreciated!Thank you! I would try pressing them a little bit flatter and add a bit more time on each side. If they are getting too dark, reduce the heat slightly. Thank you…yes, I think I made them a little too thick…will definitely make again and flatten them as you suggested, and maybe lower the heat a notch and cook just a little longer.I split them and toasted till golden, and that seem to have taken care of the doughy spots. Still yummy! Did anyone mention how wide the Master Recipe balls should be flattened before cooking? Thanks, Jeff. 4 inches sounds good. Thomas English muffins have good flavor but we find them on the skimpy side, a bit small for Eggs Benedict. May have to experiment with a little more dough than above if you think they’re too thin when you go with 4 inches. I’ve been thinking of using the buttermilk dough for English muffins for a little tang. Or would you suggest using another dough, but waiting until it’s over 3 days old? Which dough is your personal favorite for E.M.? The buttermilk dough ought to be great, but so might your other suggestion. I stagger my batches so almost always have 2 or 3-day old dough to work with– that’s my favorite for just about everything. Buttermilk’s great, if I think of it (rarely do). I have made the gf artisan bread about 6 times – love it. Is there any way I could use it for the english muffins? After the 2-hour rise and refrigerated for 24 hours, how would I handle the dough to make the english muffins? You can just press the dough into a small ball using rice flour to keep it from sticking and cook it in the same way we’ve done it in this post. I made these using a 9 grain, half bread flour half WW that I use for my “5 Min. a Day Artisan Bread”. I saved enough from baking a loaf to try these, as English Muffins are one of my favorites. I used a well seasoned dry cast iron skillet. They turned out well with a bit of adjustment in the timing and tempurature. The first side got too dark at the temp you suggested so I turned it down to med. low, put a lid on and “baked” for about 11 min. total. The second side is lightly colored and the nooks and crannies were just waiting to be filled with the luciousness of my coconut oil/butter combo and fresh home made blackberry jam. Thank you! Fantastic Patty, thanks for the kind words. We always intended for folks to customize, adjust, and compensate to match their own equipment, ingredients, and taste. Has anyone found any dishwasher safe rings? I purchased the Norpro tin played steel rings and after a few months of regular use they are rusting. The requirement to hand wash most rings is a bit of a downer…… Hopelessly addicted to these though…. The problem with stainless steel rings is that they are very expensive and harder to find. Most baking tins for pies, tarts, cakes and biscuits are all a hand wash situation. After you wash them, I put them in the oven to dry. Thanks and congrats on the Epicurious “Shout Out”! Will keep an eye out to see if John or anyone has luck with the silicone ones. In the meantime I’ll hand wash the replacement set of rings I am ordering. It was a great honor to be mentioned in that crowd of authors. I saw some silicone ones on Amazon and am tempted to try them. My tinned ones haven’t rusted, but I live in a reasonably dry climate. Silicone would be a great option, I always forget about that. Tried this first time when me&the boys made eggs benedict for mother’s day. Didn’t need to use the emergency-backup-store-bought muffins, these were fantastic! Also can be made stuffed. Flatten the ball of dough, stretch it out a little if you need, put a spoon of whatever stuffing you want (I used a little leftover shredded chicken, shredded cheese, and hot sauce), fold it all over, pinch to seal, squash it flat, let it rise, and cook as instructed.